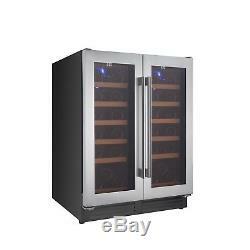 ElectriQ 60cm 36 Bottle Wine Cooler Dual Temperature Dual Zone Dou EQWINE60SDD. Enjoy full temperature control in both cavities from 5 - 22°C. 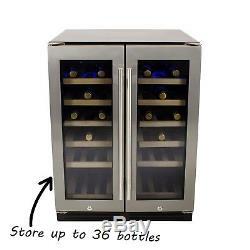 Huge 150L capacity lets you store up to 36 bottles of wine at once. Extra spacious bottom shelf to store your larger champagne, prosecco and wines. Soft blue LED lighting to showcase your collection in style. Special UV filter glass door to protect your beverages from the sun. Keep your collectible vintages locked away safe and secure. Seamless stainless steel door frame adds a touch of elegance to any kitchen setting. 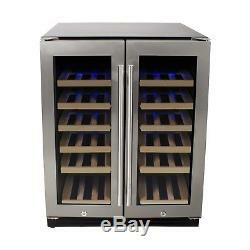 This stunning double door wine cooler is perfect for storing your favourite wines. 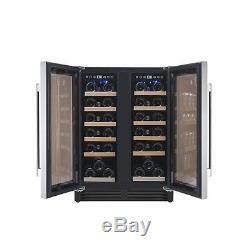 It holds up to 36 bottles of wine across two cavities which should provide more than enough space for all your collection - Whether youre a serious connoisseur or just some who loves to entertain. Each zone has its own temperature control from 5 - 22°C, so you can store different wines in each cavities or set both to suit your preferred choice, be it red or white. Theres even room on the bottom shelf to store your larger bottles of champagnes for when you want to celebrate the weekend in style. The cooler offers all the latest features such as LED lighting and UV protection, so youll be able to showcase your wine collection while keeping them protected from the harmful effects of sunlight. An active charcoal filter is on hand to remove any odours from the air that might taint your vino. Plus, it also boasts a humidity control which makes sure theres enough moisture in the air to stop corks from drying out and protect against mould. Most wine coolers including those with premium price tags have a join on the face of the door frame, this wine coolers stainless steel door frame is seamless, Its small stylish touches like this that show attention to detail and quality that sets this unit apart from the rest. Whether you have it as a freestanding unit or tuck it under your kitchen worktop, its guaranteed to add a touch of style to any room of your house. Theres even a security lock on the door too, to keep your collection safe from prying hands and prevent young ones from opening it. Dimensions: W59.5 x D57.5 x H82 cm. Capacity: 36 Bottles (standard 75cl). Shelves: 5 + 1 in each cavity. Dual zone - both cavities offer full temperature control from 5-22°C. All shelves fit standard 75cl wine bottles - storing up to 36 bottles. Double glazed, toughened glass door to insulate your collection. Smoked, UV protected glass doors to protect your wine from the damaging effects of sunlight. Premium design with polished corners. Nine sliding wooden shelves with stainless steel trim. Spacious bottom shelf fits larger bottles such as champagne. Lockable door to keep your wines safe and secure. Soft blue LED lighting to showcase your collection. Easy to use digital touch controls. Rear panel material - pre-coated metal back. Active charcoal filter prevents wine contamination. Humidifier moistens air, providing optimum storage conditions. Adjustable feet (75mm) for the perfect fit. Stylish black kick plate with stainless steel trim. Frost free technology prevents ice from building up. 19 customers have bought and rated this product, giving it an average score of. Our success has been achieved though purchasing at highly competitive prices and passing the savings directly on to the customer. Our aim is to provide customers with something many of our competitors fail to achieve: competitive pricing and a top-class service. Getting the Right Products for You Each and every order you place is checked by one of our experienced sales team. We'll take a look at your order and make sure that the products you have chosen are suitably matched. If we have any special offers or alternatives that we think might be a better suited, we'll get in touch to let you know and discuss the options over with you. If you'd like to pay by card, please have your e-bay user ID and item number ready and call 01484 448 969 with your card details. Nearly all orders arrive on time and in good condition but occasionally goods can get lost or damaged in transit, we do our best to prevent this by working the the highest quality couriers. 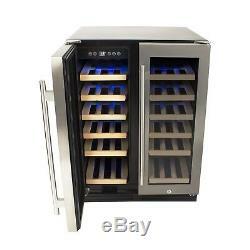 The item "ElectriQ 60cm 36 Bottle Wine Cooler Dual Temperature Dual Zone Dou EQWINE60SDD" is in sale since Wednesday, January 10, 2018. This item is in the category "Home, Furniture & DIY\Cookware, Dining & Bar\Bar & Wine Accessories\Ice Buckets & Wine Coolers". The seller is "buyitdirectdiscounts" and is located in Huddersfield. This item can be shipped to United Kingdom.